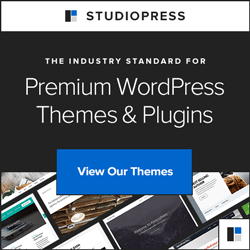 The Modern Studio Pro Theme is one of the recent releases by Studiopress. It has built in HTML5 support for faster rendering making it a very fast loading theme. Studiopress themes are generally known for being elegant and fast, and the Modern Blogger theme doesn’t disappoint. Modern Studio Pro Theme wasn’t actually created by Studiopress, it was by a company called Pretty Darn Cute Design. But it’s similar to other child themes and you also need the Genesis Framework for the child theme to work. The theme looks very simple and elegant and prefect for creating an attractive blog. It’s a fixed width theme with mobile responsive support. The theme also comes with advanced SEO settings which is perfect for getting some good organic traffic. The theme comes with 6 layout options – content/sidebar, sidebar/content, content/sidebar/sidebar, sidebar/sidebar/content, sidebar/content/sidebar and full width content. It also has three separate templates for blog, archive and columns page. The theme also comes with a custom header where you can modify the header area of the theme to your likings, custom background using which you can set any background image or color and featured images where images will displayed for each individual posts provided you set a featured image for them. The Modern Blogger Theme also consists of a portfolio page which you can use to show off the images of all the work that you have done. Having a portfolio is always a great idea because it can bring in potential clients through which you can make more money online. Along with all this you also get multiple color options and custom widgets for ad placements. And it also supports threaded comments which means comments support nesting structure up to a certain level. The theme is also ecommerce ready meaning that you can sell items online anytime. It has a cart option where items will show up when you choose products. Therefore, customers also have the ability to create their own account and there is also a specially designed checkout page which they can use to make the payments. Remember that you will need the Genesis Framework to install this theme. If you already have the framework then you don’t need to buy it again. You can just buy the child theme. The theme and the framework together costs $99.95. So, make sure you check out this awesome Modern Studio Pro Theme.